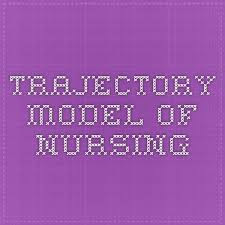 Trajectory Model is a nursing model particularly applicable in situations of people with chronical diseases developed by Anselm L. Straus, medical sociologist and Juliet Corbin, a nurse theorist. This model was developed following over 30 years of interdisciplinary research on a variety of chronic illnesses. The term “trajectory” refers to the course of a chronical disease in its different stages and phases. Chronical illnesses are serious diseases which could last the whole life of the concerned person affecting the person’s mental, emotional and social well-being. Initial or pretrajectory phase - occurs before any signs and symptoms are present. Trajectory onset phase- occurs with the first onset of signs and symptoms and includes the diagnostic period. The acute phase- follows the crisis phase and refers to the period when the patient's symptoms can be controlled by a prescribed regimen. Stable phase - this phase starts once symptoms are controlled. Dying phase - refers to a period of weeks, days, or hours preceding death . Identifying problems and establishing goals. Establishing plans to meet goals. Identifying factors that facilitate or hinder attainment of goals. Evaluating the effectiveness of interventions. Trajectory model can be used as a management instrument for the professional care. It helps the nursing person to get familiar with the patient’s perspective. Trajectory model has been applied in conditions like cancer, cardiovascular diseases, HIV, Aids, diabetes mellitus and multiple sclerosis..
Inquiry for Nursing Practice, 1991, 5, 155-174. Smeltzer SC. Use of the Trajectory Model of nursing in multiple sclerosi. Sch Inq Nurs Pract. 1991 Fall;5(3):219-34. McCorkle R, Pasacreta JV. Enhancing caregiver outcomes in palliative care. Cancer Control. 2001 Jan-Feb;8(1):36-45. Available at http://www.moffitt.org/CCJRoot/v8n1/pdf/36.pdf . Accessed on 31/1/2011. Kabinga M, Banda SS. A Conceptual Review of the Demands of chronic care and the Preparedness of Nurses Trained with the General Nursing Council of Zambia Curriculum. Medical Journal of Zambia,2008; 35:3.